Travel to a galaxy far, far away without having to blast off into outer space by simply taking a road trip to the City of Detroit. 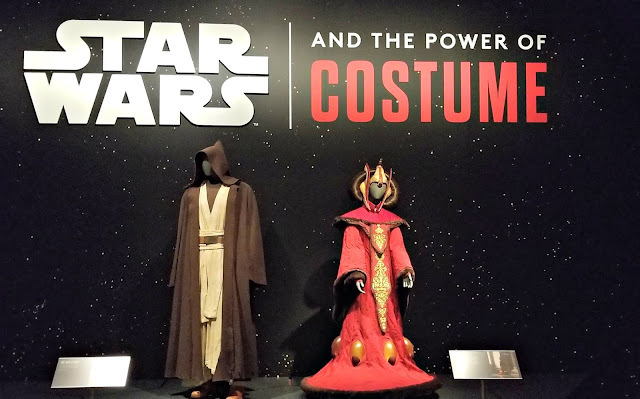 From May 20 through September 30, 2018 the Detroit Institute of Arts (DIA) will be hosting STAR WARS AND THE POWER OF COSTUME; a special exhibit produced by the Smithsonian Institution Traveling Exhibition Service in partnership with the Lucas Museum of Narrative Art and in conjunction with Lucasfilm Ltd. This spectacular exhibit provides people with an up-close look at concept art and costumes used in producing the first seven space operas in the Star Wars saga of films. 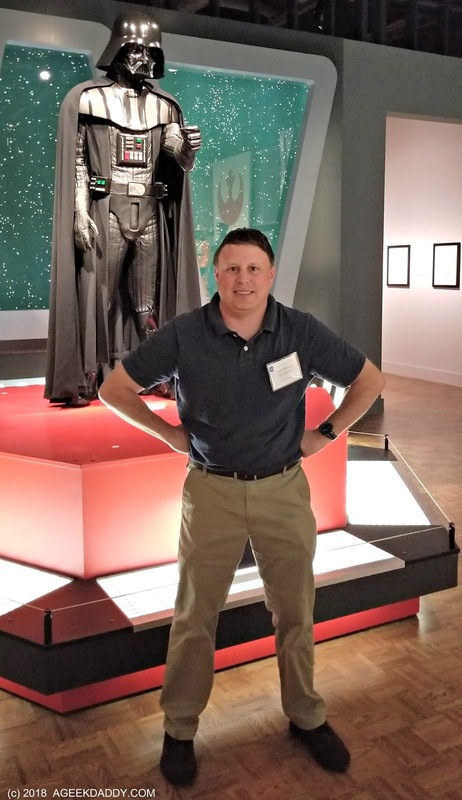 A Geek Daddy was invited by the DIA to an advance preview of STAR WARS AND THE POWER OF COSTUME before the exhibit opened to the general public. 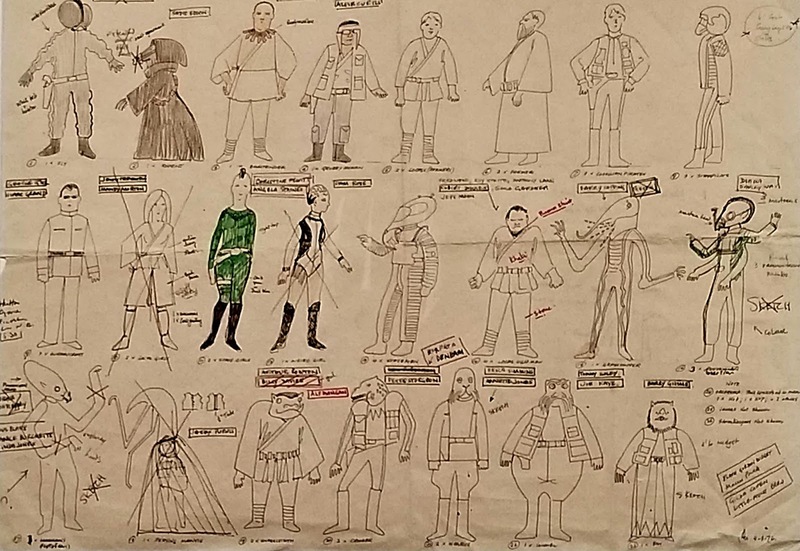 It was a fantastic experience to have the chance to be able to check out 60 costumes that appeared on-screen in Star Wars movies along with more than 150 sketches used in helping produce the look of the characters and locations within the films. 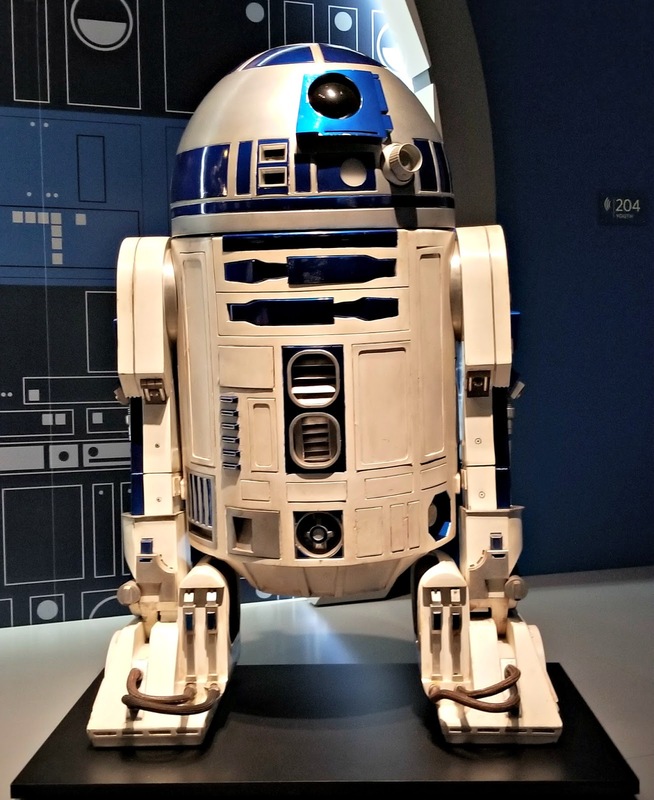 This exhibit highlights the artistic elements used in producing the films that contribute to the wonderful imagery that has captivated movie goers for over forty years and made this sci-fi saga a pop culture sensation. Star Wars fans will be wowed to be able to stand next to the actual costumes and props used to bring some of their favorite characters to life on the silver screen while someone who may never have seen the films will still be impressed by the craftsmanship of the outfits and the artistry of the sketches used in bringing George Lucas' fantasy stories into reality. Did you know actors don't normally get to keep the costumes they've worn while filming a movie? In most cases the movie studios and producers retain ownership of costumes and props after filming has wrapped up. 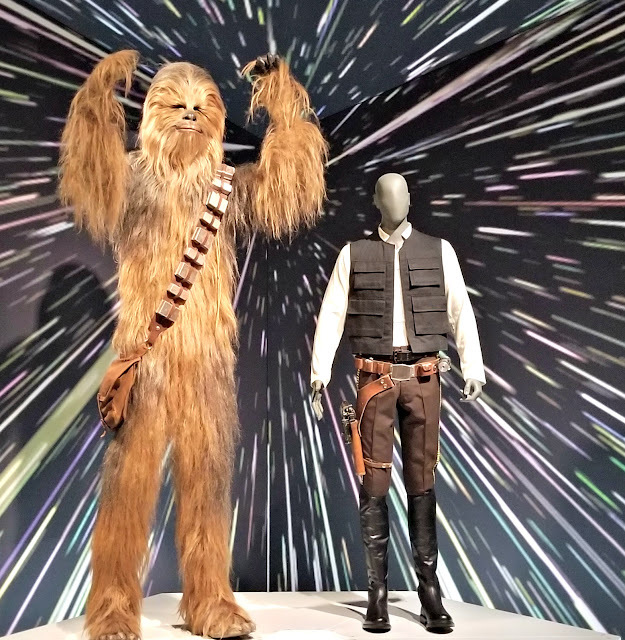 In the case of STAR WARS AND THE POWER OF COSTUME, the items on display are owned by either George Lucas or Walt Disney Studios on loan to the Smithsonian Institute for use within this traveling exhibition which is concluding its national tour with this showing at the DIA. See for yourself the actual costumes that were worn by actors while filming Star Wars scenes from the original (Star Wars, Empire Strikes Back & Return of the Jedi) and prequel (Phantom Menace, Attack of the Clones, Revenge of the Sith) trilogies as well as 2015's The Force Awakens representing some of the most beloved and infamous characters in cinematic history. Begin your trek through the exhibition by entering a room that pits the light side of the force against the dark side. In the middle of the room is an impressive fight scene that depicts the villainous Sith called Darth Maul battling a number of Jedi. A number of light saber hilt props that were used in the prequel movies are embedded with the border of the display. Press buttons near some of the informational plaques about the costumes being featured in this fight scene to hear and see some of the light sabers being wielded by the Jedi activate before your eyes just like in the Star Wars movies. This is an exciting way to begin your Star Wars adventure at the DIA that is sure to delight kids and kids at heart. 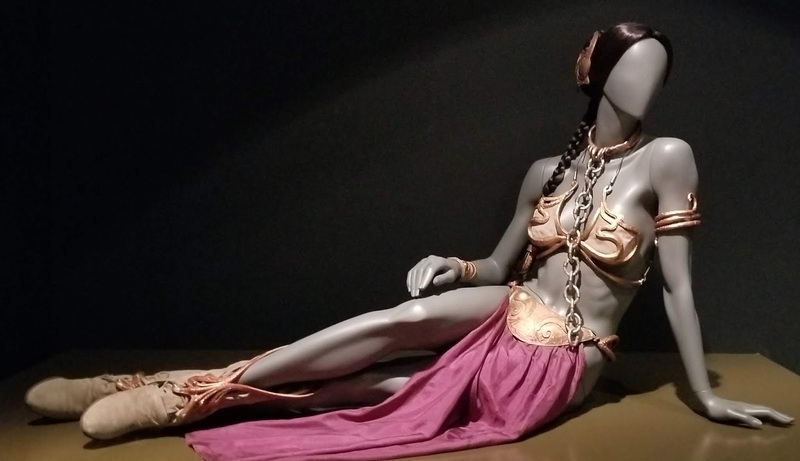 There isn't a Jabba the Hutt on display; but any guy who grew up in the 1980's will recognize a particular costume actually worn by Carrie Fisher in Return of the Jedi while being chained to that monstrosity that is viewable in a Tatooine themed showcase. 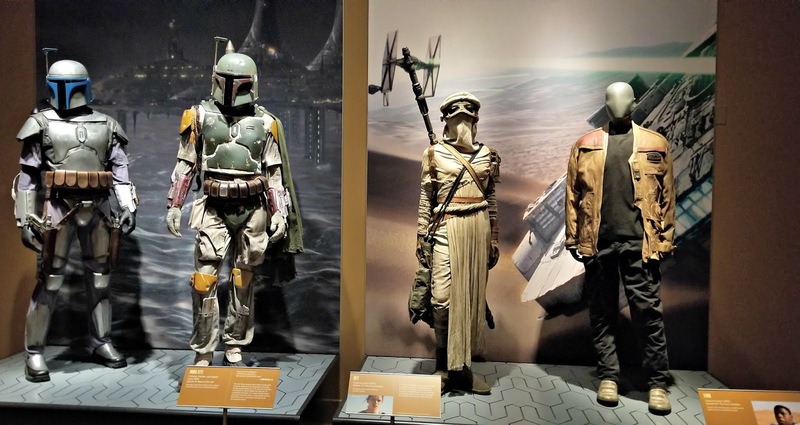 A princess outfit from the original Star Wars movie and her Boussh bounty hunter disguise from Return of the Jedi are also on display to see. 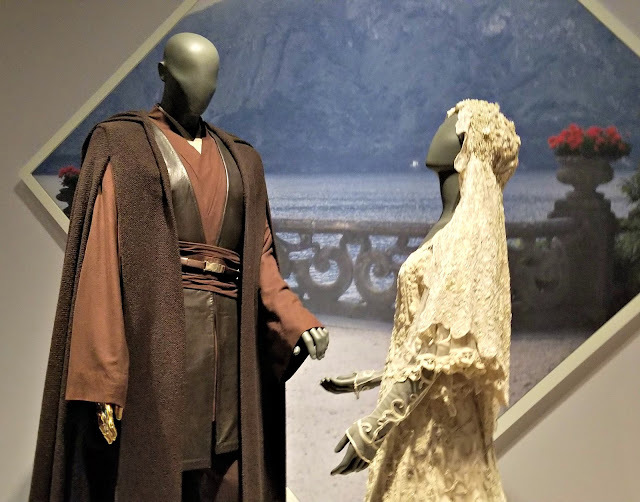 Speaking of Star Wars royalty, Padme Amidala played by Natalie Portman in the prequel trilogy has a gallery devoted to costumes worn by this character. This room has a number of fancy gowns, military uniforms, and the wedding dress for her nuptial with Anakin Skywalker (aka Darth Vader). Take a moment to look at the intricacies of these costumes whose details can't fully be appreciated until seeing them in real life. Look at this paw! Chewbacca doesn't wear shoes after all so I took a close up look at how the outfit used for the Star Wars movies handled that detail. 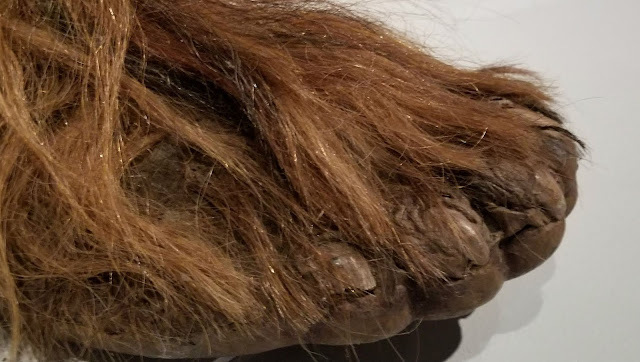 The exhibit has Chewie's original costume from 1977's Star Wars: A New Hope and you can see that it includes slipper like attachments meant to look like the alien's feet that even include toe nails. An important aspect of the character that isn't much noticed because of the attention to detail by costume designers but on the other hand would have really stood out if done poorly. I know it is just a costume but it is amazing how realistic Chewbacca looks standing right in front of you. For being more than forty years old the Chewbacca and Han Solo costumes from the original Star Wars trilogy look amazing. Shout out your best impression of a wookiee roar then press a button on the informational plaque in front of you and Chewbacca roars back at you. Another of the very nice interactive elements contained within this exhibition. You know you want to see Darth Vader! Well visitors won't be disappointed as the Lord of Sith awaits your visit. You can't resist the power of Star Wars! Stand in front of the Darth Vader costume worn in Revenge of the Sith by Hayden Christensen for a fun Star Wars photo op. I'm not going to giveaway all of the highlights of the costumes on display. Ewoks, Mandalorians, stormtroopers, and x-wing pilots … there are a whole lot more costumes on display. You'll have to visit for yourself to take in everything there is to see within STAR WARS AND THE POWER OF COSTUME. In addition to costumes, there is also a tremendous amount of concept art on display in STAR WARS AND THE POWER OF COSTUME. I'm a huge fan of Ralph McQuarrie's work in shaping the imagery of science fiction movies during the 1970s and 80s. So I was in awe getting a first hand look at some of the concept art illustrations and costume sketches by him on display. Concept artwork that helped the filmmakers visualize how they wanted characters to appear and scenes to be visualized are sprinkled throughout the exhibition. 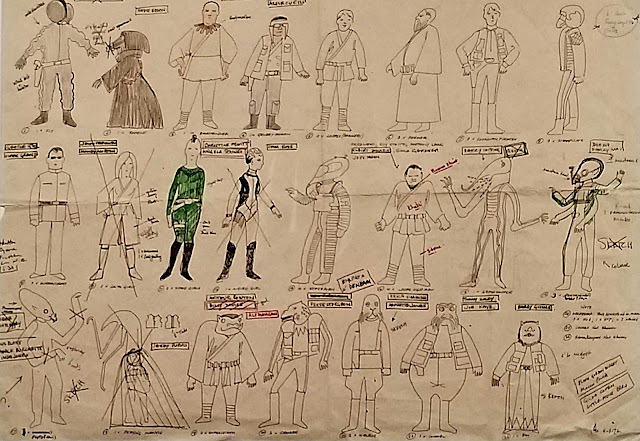 There is a hand drawn sketch that costume designers used to work George Lucas in creating the cast of characters included within the iconic cantina scene from the original Star Wars movie. That is one of my all-time favorite movie scenes that just left me in amazement when I saw it as a kid in the theater. So I really got a kick out of examining this sketch outlining ideas for alien costumes to use in that movie. I also found a showcase that combined concept art with costumes really interesting. You'll see illustrations of characters with fabric swatches for consideration in their costume designs. Impressive, most impressive! 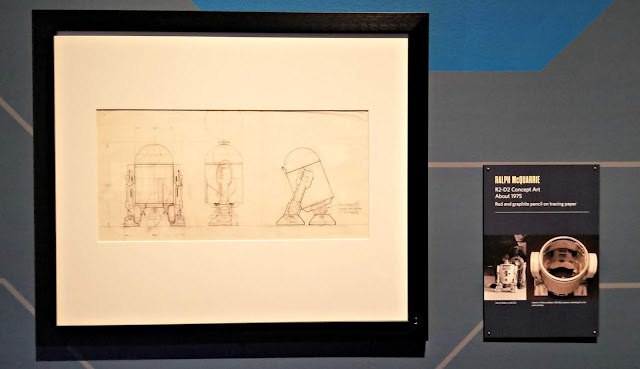 In addition to the pieces by McQuarrie there are numerous examples of concept art being shown by a variety of other artists as well. Make sure to take some time to enjoy and appreciate these artists work as you may your way through the exhibition. It really caught my attention that between the drawings of Padme Amidala by Ian McCaig along with all her costumes that this character with her strong presence throughout the exhibition must really have a special place in George Lucas' heart. In addition to costumes and concept art, there are also a good number of props on display. 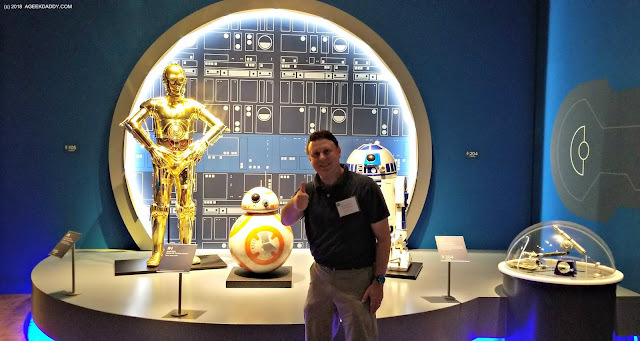 I was so thrilled to get up close to the R2D2 droid used in the original 1977 Star Wars film. I got goosebumps just being near it. This Star Wars fan was truly geeking out at this moment! Also on display is BB8 who became a fan favorite in The Force Awakens. I know seeing him will be the highlight of many kids visit. 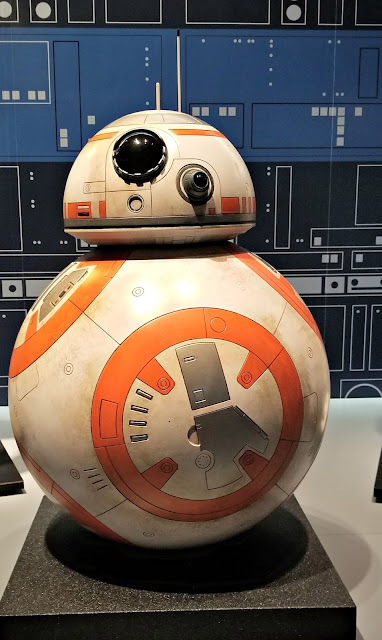 It was nice to see some elements of the newest Star War trilogy incorporated into this exhibition including this BB8 model as well as costumes worn by new characters like Rey and Finn. You'll also encounter one of the world's most famous puppets while wandering through STAR WARS AND THE POWER OF COSTUME. A Yoda puppet used in the filming of The Empire Strikes Back is the last thing you'll encounter before you exit. So you absolutely leave the exhibition on a high note. Fun you will have at the DIA! I remember as a child my parents bringing me down to visit the DIA when a special exhibit themed around the Muppet Movie (1979) was in town. It featured authentic puppets used in the movie as well as for The Muppet Show and Sesame Street television series. Kermit the Frog, Miss Piggy, Fozzie Bear, Gonzo, Big Bird, along with Bert & Ernie were all there to see. Forty years later, I still fondly remember that experience and I've had a life-long appreciation of the DIA since. I'm hoping that STAR WARS AND THE POWER OF COSTUME will have that same impact now upon my son and daughter creating a lasting memory and fostering a personal connection with the art museum. The kids have grown up being exposed to my passion for Star Wars. We've watched all the movies together and viewing the animated television series has been a favorite way for us to relax around the house together. So my son and daughter are as excited about the content of this exhibition as this die hard Star Wars fan is. So I'll definitely be heading back with them to enjoy STAR WARS AND THE POWER OF COSTUME as a fun family bonding experience. 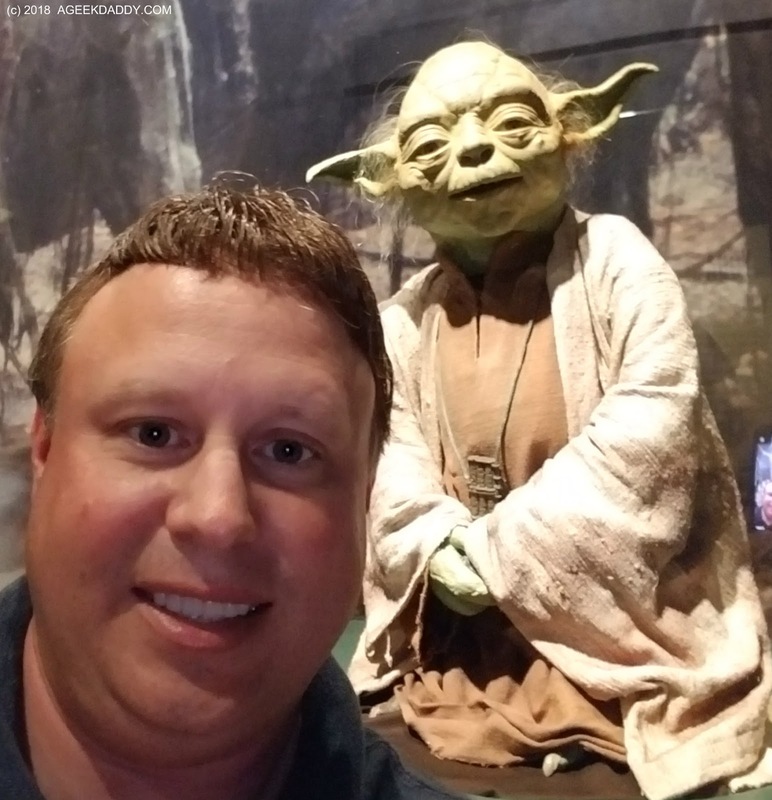 The Star Wars exhibition at the DIA has earned A Geek Daddy nod of approval not only because the items being featured are awesome to encounter but also based upon the visually stunning layout they are being displayed in. The staging and lighting of the artwork, costumes and props being showcased combined with their pop culture appeal envelope the museum with an exhilarating vibe. Most of the content of the show is also out in the open and not sealed off behind safety glass barriers providing for exceptional viewing that lets you feel like you can just reach out and touch the objects. Don't try to do that though or a security guard may rip off your arm in a wookiee like rage!!! Everyone who attends is also provided a portable device that provides an audio tour of the exhibit as part of their admission price with their being different versions to listen to for both kids and adults. These handheld digital docents are really convenient and a great way to immerse yourself in this Star Wars experience. A really nice touch by the exhibition organizers. General admission to the DIA as well as tickets for this special exhibit are required. General admission to the museum is $14 dollars for adults, $9 for senior citizens, $8 for college students, and youth at $6 with kids under 6 years old being admitted into the DIA for free. General admission to the museum is FREE for Macomb, Oakland and Wayne county residents based upon their millage in support of the museum's operating expenses. Tickets to STAR WARS AND THE POWER OF COSTUME are $7 for youth ages 6 to 17 years old. Children under 6 are FREE. Adult tickets are $19 (Tuesday - Thursday), $24 (Friday - Sunday) with Wayne, Oakland and Macomb county residents receiving a $5 per ticket discount. TUE & WED 9 a.m. - 4 p.m. SAT 9 a.m. - 8 p.m. The DIA is located at 5200 Woodward Avenue in Detroit's midtown neighborhood cultural center situated near the College of Creative Studies, Detroit Historical Museum, Charles H. Wright Museum of African American History, Michigan Science Center and Wayne State University. There is a paved lot on the north side of the museum and two parking garages in close proximity to the building with daily rates under $10. 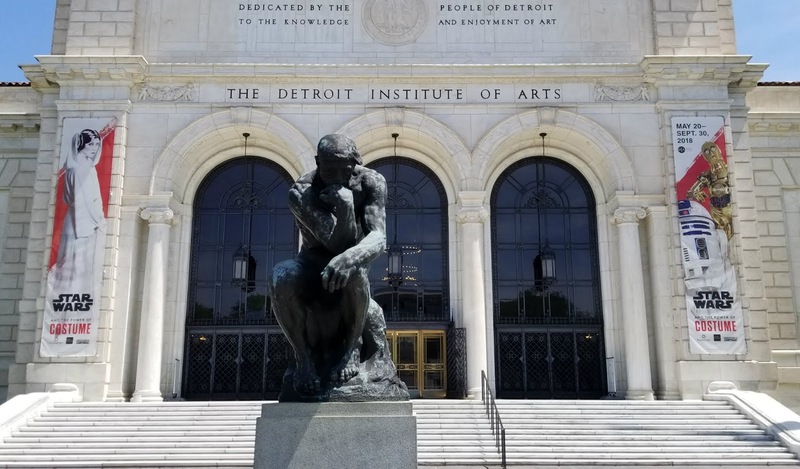 The Detroit Institute of Arts has been recognized as one of the premier art museums within the USA. It is home to more than 60,000 pieces of art and historical relics including the first Van Gogh painting to become part of a U.S. museum’s collection (Self-Portrait, 1887), the first over-life-size enlargement of Rodin’s “The Thinker” sculpture (1904), and Diego Rivera’s world-renowned “Detroit Industry” murals (1932-33). For more information, visit dia.org.